We thought we had cut the bottlebrush shrub down for good, but it was soon evident that he took it as a pruning for more vigor. That was a long time ago. 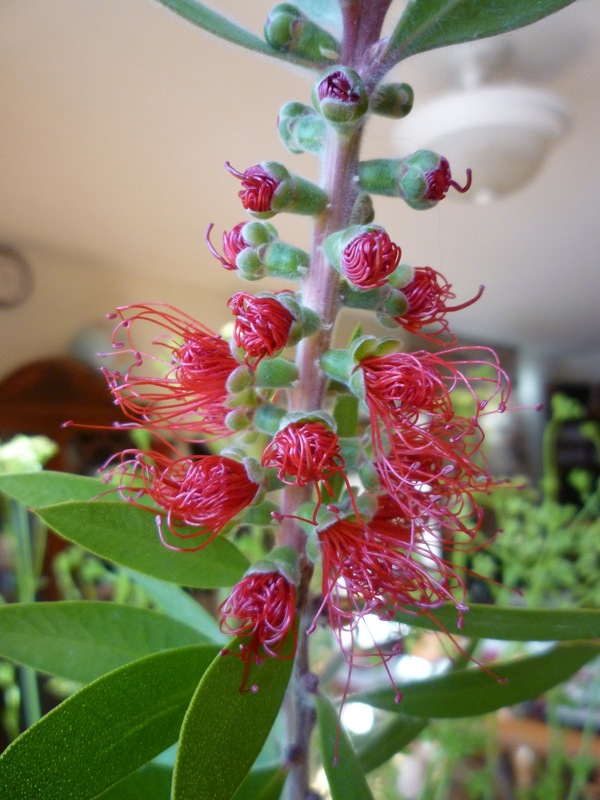 Ever since this Callistemon showed us who is boss we have liked him even less, and try not to look at him except for about twice a year when we hack away at his skyrocketing branches to let more sun shine on our nearby vegetables. We were doing that yesterday when I noticed the lone first flower of the season, barely opening, and it didn’t seem so brash and domineering when in a tender phase. I let him into the house. On the left is a photo of the amazing Early Girl tomato vine. My husband wanted to plant anything but Early Girls this year, because after 30 years of being The Best and most famous of our tomatoes, superior in every way, they were disappointing for five years in a row. I begged to plant just one Early Girl, and she has turned out to be the largest of our ten tomato bushes, with the biggest and most perfect fruits, and the consistently wonderful flavor we expect. She did not want to be cast off, so she tried really hard this time – that seems the obvious message. I will never again even think of forsaking her. 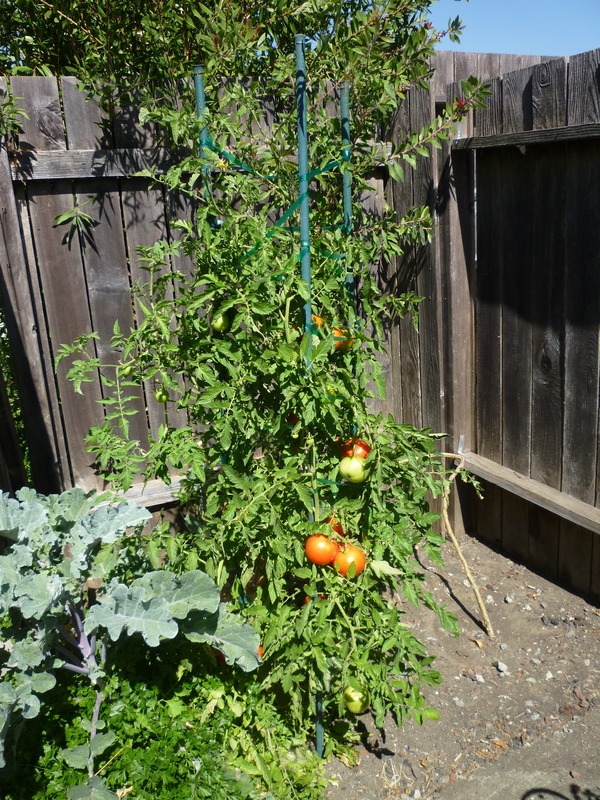 In the tomato photo you can also see the tree collard emerging from the ground like a dowel on the right side of the staked vine, and leafing out on the left side. It’s great, in theory, to have a perennial leafy green vegetable always ready for the picking, but our garden is simply not big enough to accommodate such a meandering type. 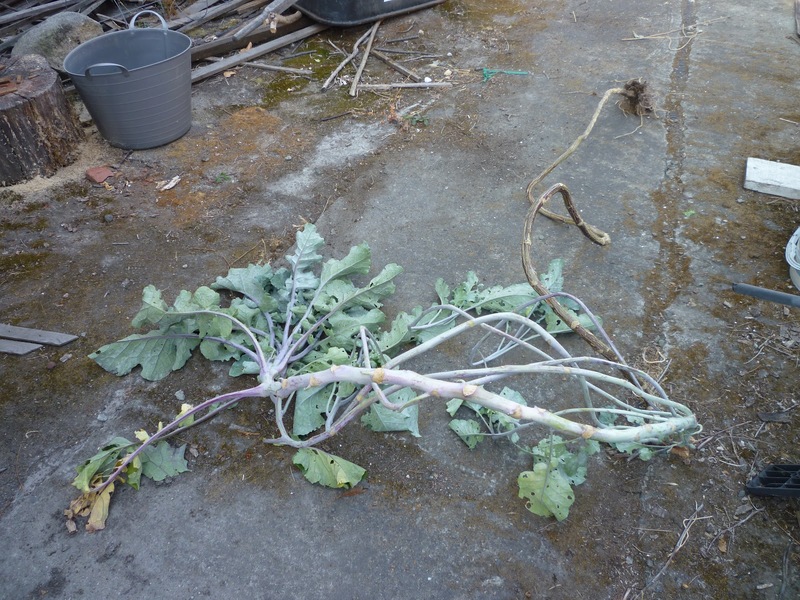 I don’t think I had ever harvested one leaf, and he was suffering an aphid infestation again, so I removed Mr. Tree Collard. Above right you can see him before he went into the yard waste bin. This is the Summer of Parsley. I like to let parsley go to seed and sow itself where it will, and in the spring there were lots of little seedlings which I stuck in here and there. They’ve now formed thick hedgerows in some places, I’ve got plenty to cook with, and new seed heads are starting to hang across the sidewalk. 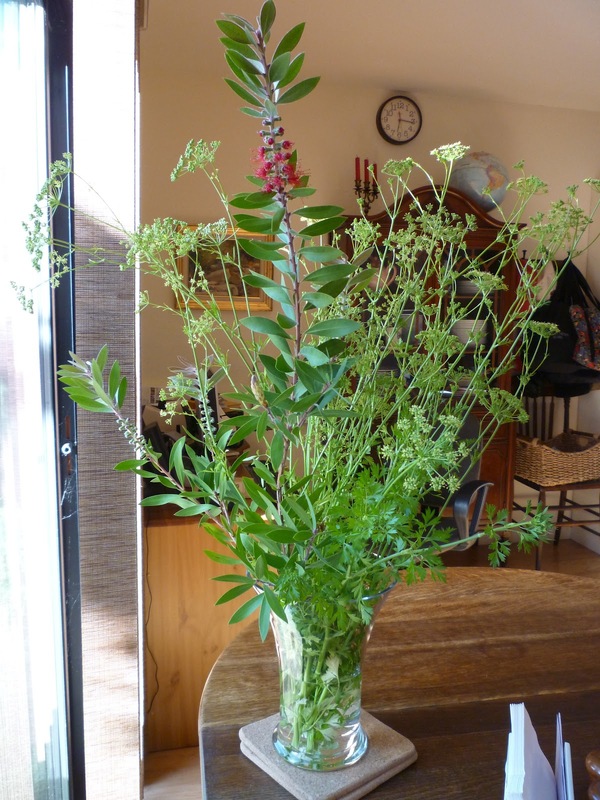 That’s not convenient, so I put those pretty sprigs into a vase with the budding bottlebrush. The parsley had been growing right under the shrub, so they weren’t complete strangers. To all appearances they are getting along, and each has something to contribute to a relationship that is proving to be a boon to the household. Ha, ha…I was thinking earlier and may still have to write a blog wherein I mention for my own scallywag purposes, your desire to only write of things you like…which you have nearly adhered to herein. Well you do like to make peace, and so you have with the bottle brush… Love, J. My neighbor in Spokane, Washington told me about Early Girl. She had a lovely garden, too! The parsley is beautiful. Tell us what dishes you'll use it for, please! I hope the weather has cooled for you. I LOVE the anthropomorphizing you do with all these plants! It's so pleasant to read, and makes them so interesting. What a lively garden you have! Lovely garden, and I never plant Early Girls ever so I might have to do that next year. Next year, at this point I am tired of gardens and thought to myself no garden next year. I have never heard of a tree collard. That flower you brought in the house is wonderful. I will have to look that one up. Very interesting. My Early Girls are doing very well this year and so are the Beefmasters. It's been hot so they are pretty happy, all of them. I like the flower/parsley arrangement. I like parsley a lot and I like your idea of using it with your flowers. Pretty! love your arrangements, right up my alley. look for an e-card from me, via jacquie lawson.